After a series of disappointing outfits, which put their sister-in-law Meghan Markle even more in the light, the Duchess of Cambridge has hit the mark. 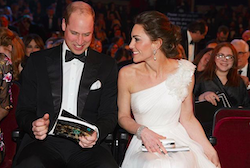 On the occasion of the BAFTA 2019, the consideration of the British Oscars, Kate Middleton wore a white dress draped in silk chiffon with a single wing of petals. Refined as a few, stylish as never before and, once again, luminous: Kate Middleton has returned to amaze and make a loud “wow” shout to even the fashion industry. We see all the details of his beautiful outfit! Bafta 2019: Kate Middleton in Alexander McQueen (again). On the red carpet of the Royal Albert Hall in London the Duchess of Cambridge fascinated and enchanted with a dress by Alexander McQueen. The Maison dresses William’s wife on the most important occasions. They are also the royal wedding dress, while the diamond earrings with pearls come directly from Lady Diana jewelry box. Surprised of this look? A little ‘yes, because Kate has not been there for more time. Lately it was too compliant with the real label, also due to the 3 close pregnancies and increasingly rigorous commitments. In addition, the arrival of Meghan Markle at court has certainly not simplified her life. The American sister-in-law of style has to sell and dares with glamorous and refined dresses, haute couture masterpieces that show off with great class and confidence. This time Kate would also be facilitated by the absence of her sister-in-law, who seems to have stayed home because of her pregnancy.